Becca and Brian's Grand Adventure: I did move... right? 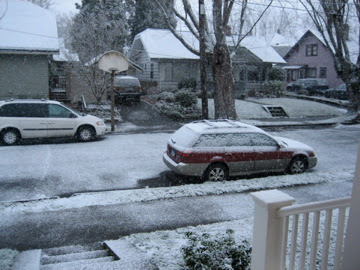 Hey, you are totally right about the overreaction to the light dusting of snow this morning here in Portland. The source of the problem is the weather-hype propaganda that the local weathermen force upon us. Every night they lead the nightly news with stories about huge potential snowfall and bad road conditions. The next day is always warmer with less snowfall than predicted. Anything to get ratings, I guess. Good luck with your studies !! !